﻿ What is SFP+ Direct Attach Copper Cable? The SFP+ interface offers the highest density, lowest cost, and lowest power 10 Gigabit Ethernetsolution commercially available today. Further SFP+ enables mass migration of the 1GbE network to10 GbE by offering a very low cost 10GSFP+Cu (direct attached copper cable assembly) option for short reach interconnects along with multimode and single mode fiber options. The SFP+ interface accepts along with hot-pluggable, small-footprint, optical transceivers, a Direct Attach Cable “10GSFP+Cu”, which replaces two optical modules and a connectorized optical fiber with a twinaxial copper cable assembly. The 10GSFP+Cu option is defined for 10GbE applications over passive copper with a reach of 8.5m. The 10GSFP+Cu link utilizes a receive equalizer in the host PHY/SerDes in order to compensate for the Inter Symbol Interference (ISI) introduced by the cable. Electrical and mechanical specifications for SFP+ optical modules, 10GSFP+Cu, and hosts are defined in the SFF-8431 specification developed by the SFF Committee, with broad industry participation. 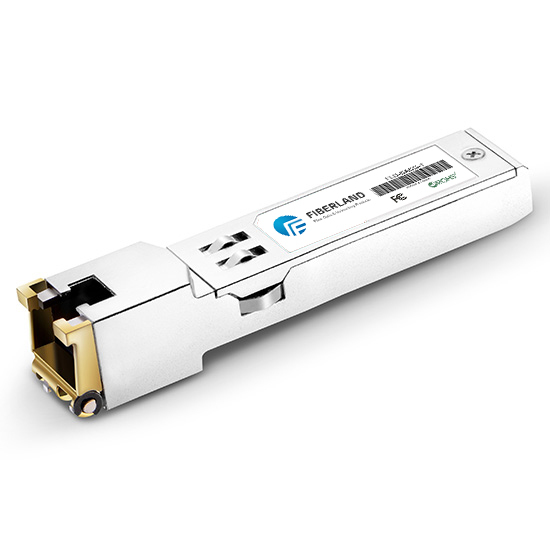 10GSFP+Cu (SFP+ Direct Attach) is a copper interconnect using a passive twin-ax cable assembly that connects directly into an SFP+ housing. It has a range of 10 meters and like 10GBASE-CX4, is low power, low cost and low latency with the added advantage of having the small form factor of SFP+, and smaller, more flexible cabling. SFP+ Direct Attach is known as the successor technology to 10GBASE-CX4. SFP+ Direct Attach, as implied in the name, uses SFP+ MSA and by using the inexpensive copper twinaxial cable with SFP+ connectors on both sides, provides 10 Gigabit Ethernet connectivity between devices with SFP+ interfaces. SFP+ Direct Attach has a 10 meter distance limitation, thus the target application is interconnection of top-of-rack switches with application servers and storage devices in a rack. Passive cables are much less expensive but require the host to do the work of driving it properly. Active cables offer the added benefit of being "optical-module" like. How does SFP+ Direct Attach Copper compare with 10GBASE-T? 10GBASE-T will work with Cat 6 and Cat 7 cables that are commonly used for 1Gb network connections and also support much longer distances than SFP+ Direct Attach Copper. 10GBASE-T is currently not supported for OneConnect adapters due to power requirements and high latency of 10GBASE-T PHY chips. 10GBASE-T PHY technology continues to evolve and could be suitable for adapter products by the end of 2010.